It is scary and surreal to think the year is half way over! I feel like I'm kind of cheating because looking back at my June goals right now, I'm only starting to do them in July. Whoopsies. Technically, though, until I do this blog post it still counts right? Sure. So I started biking to work again this week, which has been going well so far, so I anticipate continuing that for the following months. I did get a date night in with the hubby, albeit it was the 4th of July. I did not spend a relaxing day during our vacation but we are going on a working vacation in August (at least working for the hubs) so I anticipate plenty of relaxing days as he'll be in conferences all day. So I'm not too gutted that I didn't actually accomplish that one. I mean, even though it took me to the very first week of the new month to complete the goals, they still got done, okay. Okay. 1. In July I really, really want to take some time to get back into yoga. Honestly, I need it more for my mental health than anything and with the last few months being busy and rocky, I need it now more than ever. I'm shooting for doing a 30 min session at least 3 times a week. 2. Drink more water. I'm on and off with this one...I used to be really good at drinking about 10 8oz glasses a day but with my coffee consumption at an all time high I find myself drinking like 4 or 5 a day, which isn't nearly enough. I want to be more cognizant this month of that. 3. Complete all my tasks before settling down for the night. Now I'm not talking about getting everything done on my never ending to-do list...I'm talking more daily tasks. I used to be super good about getting everything I needed for work, etc, together the night before but lately, I've taken an "I'll do it in the morning" stance. Not only do I forget half the things I need but it also starts my day off super frazzled and crazy, and we all know I don't need any more of that going on. It really is amazing how quickly time flies by! I can't believe that it's already July either. I think you selected three wonderful goals to focus on Kim! I haven't done Yoga since college, but it was a great stress reliever, although college wasn't all that stressful compared to the trials and tribulations of being an "adult". Anyway, good luck with this month's goals! Time is speeding along huh? I keep saying I'll drink more water...Coffee has water in it right? That counts right? These are great goals, Kim! I need to get better about drinking more water too. So crazy to think the year is already more than half over. Ah, I love this! I need to start making goals for myself more often. I feel like I haven't been motivated lately, but maybe setting goals will pick me back up. Yep I'm a water drinker too but get so busy I lag off. 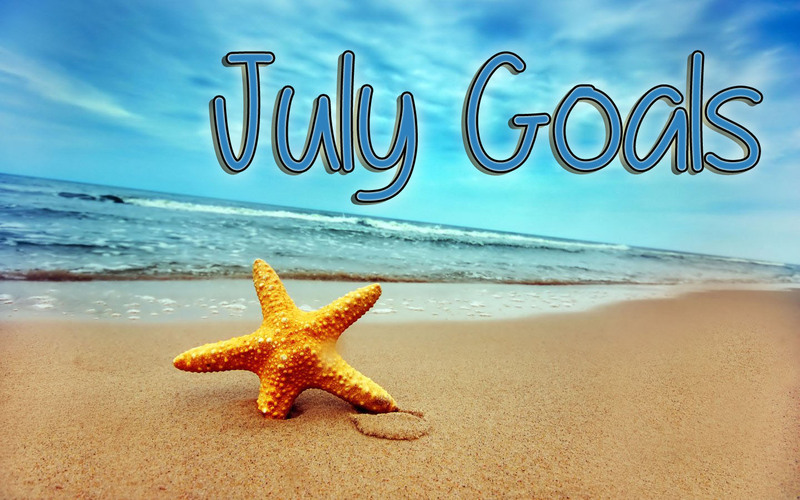 You are a strong, determined lady and you will tackle those July goals as best you can. ;-) Hope you've had a great day beautiful! !